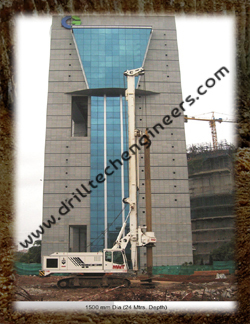 We are leading names in the industry, offering world-class array of Piling Foundation services to our clients. Our entire services are well-planned and are executed as per the exact preferences of our clients. We are supported by experienced professionals who understand the requirements of the clients and deliver the entire services accordingly. Piling Foundation is the part of a structure used to carry and transfer the load of the structure to the bearing ground located at some depth below ground surface. The piles are extremely useful when the soil conditions are in very loose/weak conditions that a washout, erosion and scour of soil underneath leads to the collapse of shallow foundations. Our proficiency lies in complete construction and development works, be it for buildings & structures or for roads, dams, bridges and others. Clients can avail our Piling Foundation services for the development of Pile Foundation. These Piling Foundation services are instrumental in carrying as well as transferring the load of the establishment to the bearing ground beneath the surface. Owing to their timely execution. It is very important to select the right vendor in order to be able to achieve total client satisfaction. We offer to the customers is made available at very affordable rates in the market and we have a highly efficient and skilled staff working for the company.